Sometimes making something from scratch is the thing to do. Either we cannot get the same results any other way or we just truly enjoy the time in the kitchen. And then sometimes we want something quick and easy but we don’t want to sacrifice flavor. 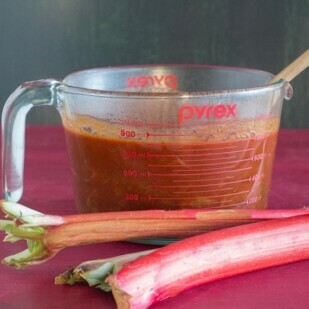 This Rhubarb BBQ Sauce is a quickie recipe based on FODY BBQ Sauce and it is fantastic! Sweet, hot, tangy, thick and luscious and equally at home on slow-cooked pork, grilled chicken, fish or even tofu and vegetables. 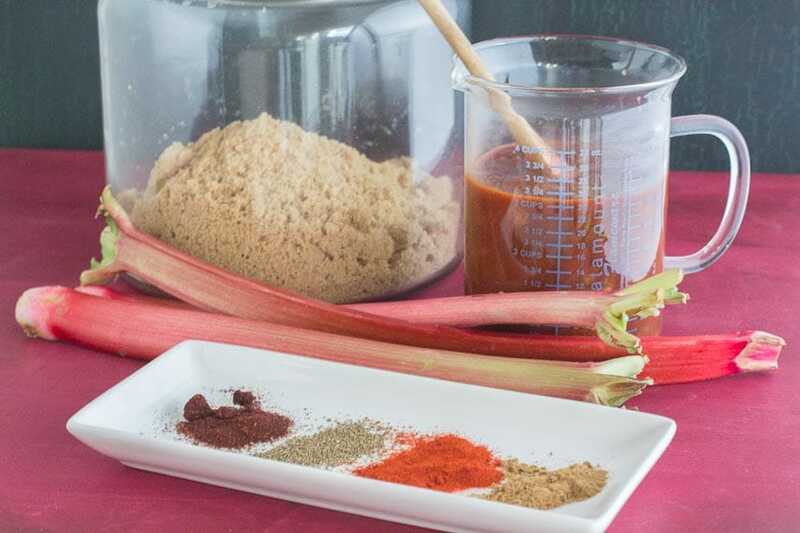 Rhubarb has no detectable FODMAPs and we love using it in both sweet as well as savory recipes. You might have noticed that we have a cake or two, a tart, chutney and more. Just put “rhubarb” into our filter and you will see what we mean. You can also read all about this vegetable in our Ingredients column. 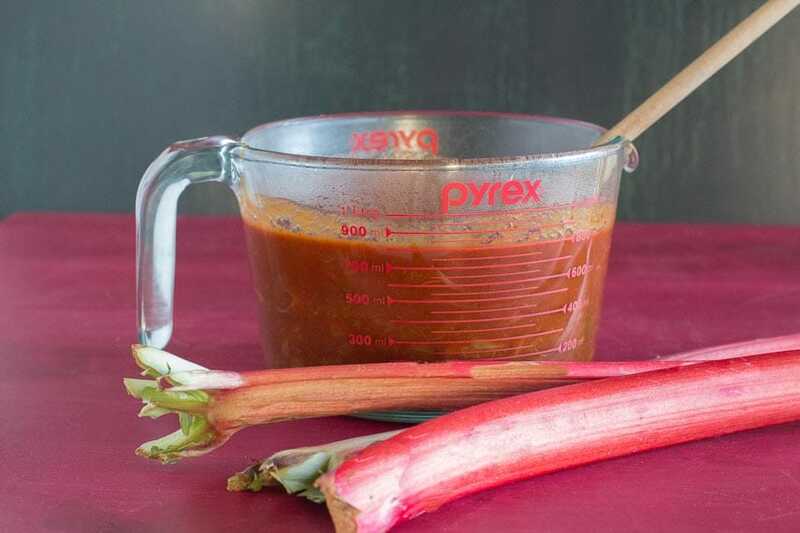 This recipe begins with cooking fresh rhubarb with all kinds of BBQ friendly spices and flavors like cumin, chipotle chile, smoked paprika and molasses in addition to FODY BBQ Sauce. During the brief simmering time, everything comes together into an easy sauce that is truly more than a sum of its parts. And, check out the Tips at the end of the recipe to see how easy it is to make a larger batch. Check out our Slow-Cooker Pork with Rhubarb BBQ Sauce to see this recipe in action. This Rhubarb BBQ Sauce is quick to make and takes advantage of ready-made BBQ sauce like the one form FODY. Heat a large saucepan over medium heat and add oil, swirling to coat the bottom of the pot. Add leeks and sauté for a couple of minutes until softened but not browned. Add the FODY BBQ Sauce, rhubarb, brown sugar, molasses, vinegar, celery seed, cumin, smoked paprika and as much chipotle pepper as you like and stir together well. Add some salt and several grinds of black pepper. Adjust heat and simmer, covered, until rhubarb is soft, about 10 minutes. Adjust salt and pepper and any other seasoning you might want. I have made this sauce a few times and have on occasion doubled the amount of FODY BBQ Sauce and used 2 bottles with the same amount of other ingredients. The first time I did this I needed lots of sauce and didn’t have time to start from scratch. So I simply added another bottle of sauce to the simmering pot of sauce and it worked very well! So if you want more rhubarb flavor, make it as described above. If you need lots of sauce or just love the flavor from the bottled sauce, add another bottle!